Coldness, numbness, tingling or cramping in your feet may indicate poor blood circulation. Some individuals also note that sores and infections heal too slowly. Diminished circulation to your feet can be uncomfortable and indicate an underlying health problem. Certain herbs may help with poor blood circulation in your feet. Before taking herbs, however, consult a botanically trained health care professional for personalized advice on herbal forms, combinations and dosage, as well as for safety considerations. Your blood carries oxygen and nutrients to your limbs and tissues that are essential for normal functioning and healing. When blood circulation to your feet is diminished, you may experience altered sensations, such as cold or numbness, and your capacity for wound healing is compromised. Poor blood circulation may be a result from an underlying health condition, such as peripheral vascular disease, Raynaud's phenomenon, diabetes or a cardiovascular problem. Smoking and certain medications can also reduce your circulation. 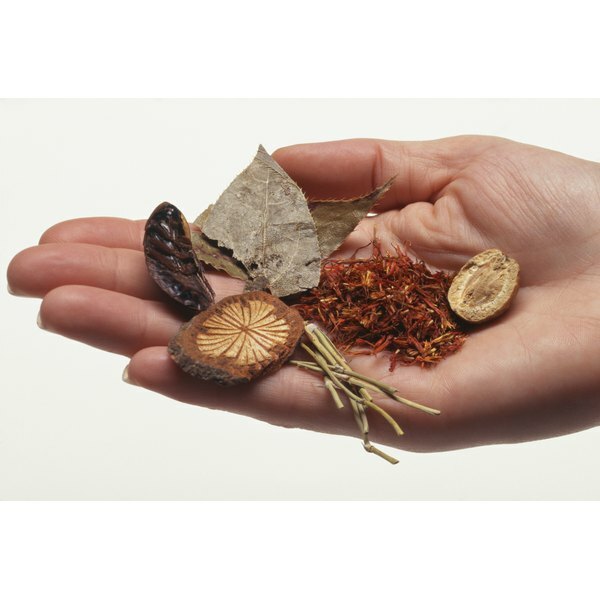 Certain herbal remedies are thought to improve circulation. They work by strengthening your blood vessels or diminishing your blood's propensity to clot within your circulatory system. To improve your circulation, Phyllis Balch, a certified nutritional consultant and author of "Prescription for Nutritional Healing," suggests the herbs black cohosh, butcher's broom, cayenne, chickweed, gentian, ginkgo, goldenseal, hawthorn, horseradish, hyssop, licorice, pleurisy root, rose hips and wormwood. Balch warns that some of the above herbs can affect pregnancy and influence chronic disease or should only be used on a short-term basis. A qualified health care professional can help you determine your best options. Cayenne pepper is popularly employed as a hot and spicy culinary spice. Cayenne, known by its Latin name Capsicum annuum, also has a 9,000-year history of medicinal use. Practitioners of traditional medicine systems of India, China, Japan and Korea, as well as contemporary naturopaths and Western herbalists, use cayenne to alleviate digestive problems, muscle and joint pain, and circulatory problems. Cayenne enhances blood circulation by reducing blood clots, lowering blood pressure and protecting an individual from atherosclerosis, states Dr. Sharol Tilgner, a naturopathic physician, in her book "Herbal Medicine From the Heart of the Earth." Cayenne also encourages blood flow toward the body's periphery. Tilgner adds that cayenne is best for individuals who tend to feel cold and sluggish, and should be avoided by people who tend to be warm. While various herbal remedies may enhance your circulation, it's useful to understand why your circulation is diminished in the first place. Poor circulation can be secondary to a number of health conditions, and addressing the underlying cause may help alleviate your symptoms. Consult your doctor for a proper diagnosis and individualized treatment. Also, note that herbal remedies can have powerful effects on your body and can interact with certain medications, so discuss with your doctor any herbs that you may be considering.